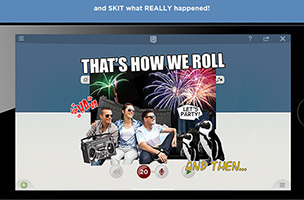 Storytime Studios has announced the launch of its photo animation app Skit! on Android. The app allows users to show off their creative expression, creating personalized videos using drawings, animated text, photos that “move” and other visual effects. Skit allows users to create videos using backgrounds, props, characters and text, which are either included in the base app or imported from a user’s camera roll or Facebook account. Pictures of friends or animals (or other “characters”) can be cropped from their original images by drawing a line around them, and these characters can then be placed into different backgrounds. Once users are happy with a scene’s setup, they can record their Skit in the recording frame inside the app. This gives users the ability to interact with objects while the Skit is recording, dragging images around to make them move, among other effects. Users can also record their voices to add audio to their films. The Skit app offers hundreds of stock stickers, characters, backgrounds and props, as well as a new Valentine’s Crush content update, which features love-themed backgrounds, templates and even competitions to create the best skits. As a video sharing community, Skit offers personal profiles, the ability to follow others, track the views and “Likes” on Skits, and “Re-Skits” of entertaining content. “Other apps focus on manipulating photos with baked-in graphics. The result is a single frame static message. With SKIT!, photos come to life with motion: they breath and walk, stickers animate, and FX are cinematic. The best part, every story shared can be continued or remixed by the viewers – nothing is baked-in, which unlocks a really fun form of collaborative creativity,” said Skit Co-founder Robin Johnson. Skit is available to download for free on Google Play and the Amazon App Store. It was previously released as a free download on iOS. Check back soon to follow Skit on AppData, our tracking platform for mobile and social apps and developers.